For an interpretation of other famous examples of German portraiture, see: Famous Paintings Analyzed (1250-1800). Hans Holbein ranks alongside Matthias Grunewald (1470-1528), Albrecht Durer (1471-1528) and Lucas Cranach the Elder (1472-1533), as one of the top Northern Renaissance artists of the early 16th century. Although born in Augsburg, Holbein was active mainly in Basel until his mid-20s. A prolific and versatile contributor to all forms of Northern Renaissance art - he produced propagandist forms of Protestant Reformation Art (Lutheranism had arrived in Basel), civic mural paintings, book design and illustration - he became best known for his portraiture, both in Basel and especially in England. His range included large religious paintings, such as The Solothurn Madonna (1522, Kunstmuseum Solothurn) and The Passion altarpiece (1525, Kunstmuseum Basel), as well as miniature painting - see, for instance, his miniature portrait of Anne of Cleves (1539, Watercolour and gum on vellum in ivory case, Victoria and Albert Museum, London). Although his early painting was influenced by German Gothic Art, which he absorbed from his father, Hans Holbein the Elder (1465-1524), and from the work of Matthias Grunewald - see for example The Body of the Dead Christ in the Tomb (1521, Kunstmuseum Basel) - his maturing style was enhanced by artistic developments in the Italian Renaissance, notably the work of Andrea Mantegna and Leonardo da Vinci - see, for instance, his use of sfumato in Venus and Amor (1524-5, Kunstmuseum Basel). His main contacts during his early period in Basel came from within the city's Humanist circles. 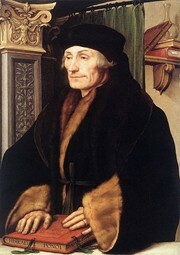 In 1515, for instance, he was commissioned to produce several pen and ink drawings for The Praise of Folly by the humanist philosopher and scholar Desiderius Erasmus of Rotterdam (1469-1536), whose portrait he painted and who later provided him with an introduction to his friend Sir Thomas More, in England. It was here that Holbein achieved his greatest artistic success, establishing himself as one of the best portrait artists of the century. The subject of this iconic portrait - Desiderius Erasmus (1469-1536) - was the most eminent scholar and humanist philosopher of the Northern Renaissance. His most famous books included: The Adagia (1508), Encomium Moriae (1509), The Praise of Folly (1549), as well as his celebrated edition of the New Testament (1516). In addition to his scholastic research and publications, Erasmus was a persistent critic of the ecclesiastical abuses committed by the Church of Rome, and encouraged the demand for reform, which culminated in Luther's Protestant Reformation and in the Catholic Counter-Reformation. Urging an equal restraint on the zealots of Lutheranism, Erasmus's even-handed stance provoked the wrath of extremists on both sides of the debate. In 1521, he moved to Basel, the city in which Holbein was active at the time. Since Erasmus corresponded with other learned men thoughout Europe, he regularly commissioned drawings of himself to send to friends and supporters. In this case, Erasmus commissioned the portrait as a gift to William Warham (1450-1532), the last pre-Reformation archbishop of Canterbury. This portrait (in the National Gallery, London) was painted during Holbein's first period in Basel. He also painted two other portraits of the scholar, both entitled "Erasmus of Rotterdam Writing". One is now in the Louvre (Paris), the other in the Kunstmuseum (Basel). These three works have since become the definitive portrayals of Erasmus and the source of a great many copies. However, the portrait in London is the largest, most elaborate and most 'humanist' of them all. Although it presents a formal three-quarter view of the subject, it has been described as a deliberately idealized picture of a sensitive and erudite scholar - which was exactly how Erasmus preferred to be remembered by future generations. His cultured and enlightened character is alluded to by the Renaissance pilaster, while his scholarship is referenced by the copy of the New Testament before him and the books on the rear wall. These are subtle and relatively low key symbols, entirely in keeping with the sitter's image of modesty and self-restraint. At the same time Holbein conveys the sitter's importance in a much more direct manner, by filling the picture plane with his figure, and by the use of a non-reflective colour, like black, to add solidity. The effect is one of calm monumentality. A master of drawing and rapid sketching, Holbein adhered closely to the tradition of methodical preparation perfected during the Netherlandish Renaissance. His figurative chalk drawings (sometimes with silverpoint) demonstrate his mastery of outline and draughtsmanship. Typically he relied heavily on preparatory portraits and studies of his sitters, though many drawings survive for which no finished painting is known. This implies that some of these studies were executed for general use. Holbein completed relatively few portraits during his years in Basel. Surviving portraits include those of Jakob Meyer (1516, Kunstmuseum Basel); Dorothea Meyer (1516, Kunstmuseum Basel); Benedikt von Hertenstein (1517, Metropolitan Museum of Art, New York); Bonifacius Amerbach (1519, Kunstmuseum Basel); and Johannes Froben (1523, Royal Collection). In addition he executed two mythological paintings - Venus and Amor (152425) and Lais of Corinth (1526), both in the Kunstmuseum Basel. Some years later he completed a miniature painting of Erasmus (1532) which is also in the Kunstmuseum, Basel. Frick Collection, New York City.  For more outstanding portraits of the Protestant Reformation, see: Homepage.